Some support from Marcus for an other mayor brand called Oak Wheels. These wheels perform great and have the most natural feeling. Check out this new Video like always a great edit with amazing tricks from Marcus. The new V one bearing wheels are out now! It’s the first version of a new line of wheels. These wheels are rotated on a lathe for more precision and they don’t have any mold marks. They have high quality bearing that roll very smooth and long. You can use them on all trucks that are available. No real spiders in this on. Just chilled music with nice tricks from Ronisha. Although some snowboard action. So check it out! In this article we show you how to setup your fingerboard. 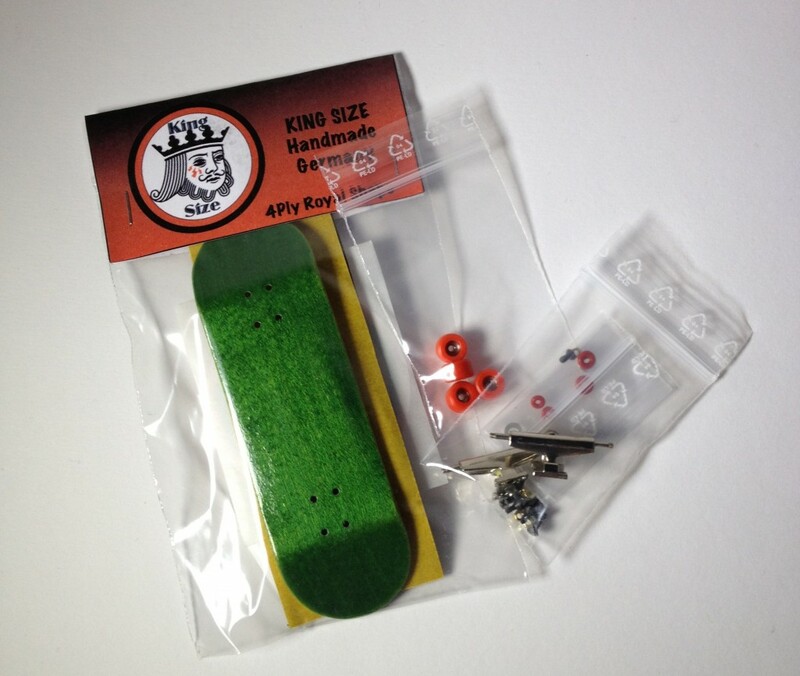 We only use products from our onlineshop www.kingsize-fingerboards.de to show you this. 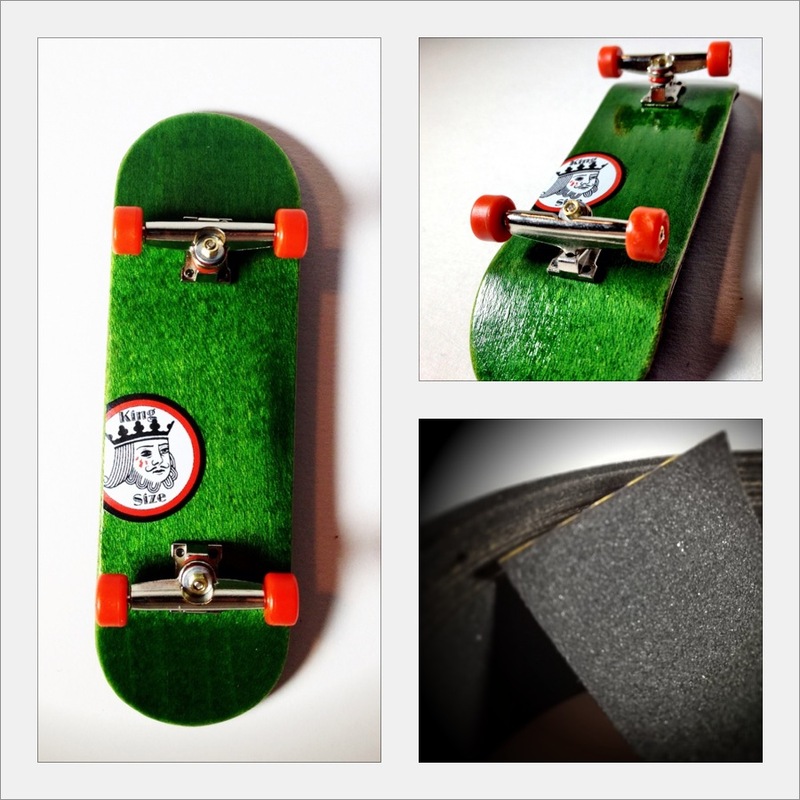 The main parts of a fingerboard are the deck, trucks, wheels and tape. You have to put all these part together to get your fingerboard rolling. We create a step by step explanation on how to put your setup together. First we show you how to put your trucks together. Normally trucks are shipped with 8 screws, 6 nuts and bushings. Bushings are soft rings that helps the trucks to move sideways. A packet of bushing includes 4 washers, 2 small and 2 big bushings. Your trucks are ready now. The next step is getting the wheels on the trucks. This is a really easy part. Just take your wheels and the rest of the nuts. Then put a wheel on the axle-pin and adjust the wheels with a nut. Do this 4 times and your trucks should look like this. Know you have to put the trucks and wheels on your fingerboard. For this you have to use the 8 screws from your trucks. This is a little bit tricky if you doing it the first time. You probably have to take some time for this step. Cause you want the trucks to fit perfectly on your fingerboard. Hold the truck with your thumb and try find the right place for the truck. You can use a light source for help. Just hold your Deck into the light and adjust the trucks holes and deck holes. Then take 4 screws and screw then from the upper side of the deck into the truck. The best way to do this is put on screw in. Then you can adjust the trucks again and screw the other screws in.Do this 2 times and your deck should look like this. The last step before you can start shredding you fingerboard is get your tape on the fingerboard. For this we use a file you can just take a nail file. Take your tape and remove the back then you can stick your tape onto your fingerboard. Now start filing around the edges of the deck till you can remove the part of the tape you don´t want on your deck. „Replication” is a new project, I started now in 2012. The idea is simple. I try to replicate skate tricks as good as I can on my fingerboard. For this, I rebuild the spots out of the videos and try to look the tricks like the originals. This series shall show, how equal Finger- and Skate-boarding is. Otherwise I’m really open for any criticism and I appreciate every single comment. You would also help me a lot, if you send me any cool skate tricks of pro skaters, I could replicate!